The acquisition of any knowledge is always of use to the intellect, because it may thus drive out useless things and retain the good. For nothing can be loved or hated unless it is first known. Any area of study is enhanced by an increased capacity to make use of relevant findings provided by new forms of analysis. The process of determining authorship of an artwork, particularly in the Renaissance is at present, a largely undocumented, hidden endeavour. A task primarily concerning the art market, academic and museum sector, its dealings occasionally permeate the public sphere when a new discovery emerges associated with a well known artist. A standardised process lies at the heart of the scientific method. This requires that anyone trained in the underlying principles of this method can reproduce the exact conditions of an investigation and its result. This is underpinned by statistical enumerators, which aim to quantify degrees of error in measurement, biases and variation due to external and internal factors. Reading any reputable scientific document, much of this information is often laid out bare in order to demonstrate the efficacy of the process, and allow critical analysis. How does this relate to art attributions? Analysis of artworks for authenticity, has for a long time been a very subjective process. Closely guarded by its proponents, a critical analysis of a piece and the mode it is reported in has done very little to enlighten others of the efficacy of their expertise. This may have been acceptable at one time, but the increasing use of public funds and appeals for donations by museums to purchase works compels such processes be made transparent and openly reported. From a legal perspective, the art market itself is under strict obligation to provide that attributions have been made with due diligence. There is a degree of controversy around the topic of connoisseurship used in verifying authenticity of artworks. On closer examination, the key to this discussion seems to be around the type of analysis that relies heavily on the intuited responses of a particular expert. An increasing use of quantifiable methods in analysing artworks have required that the role of the connoisseur be revised. It now becomes a collaborative effort, comprising experts in different fields. As previously discussed, defining authorship is the first step in clarifying these processes. The present definitions employed are simply insufficient in matching the level of detail provided by new modes of analysis. Built into this is an added degree of responsibility by these investigators to report their findings in a manner that is transparent and allows reproduction of testing methods and critical analysis to be properly conducted. There is presently no definitive text on the attribution process, no standardised training or modes of reporting. Specialists from different centres come to their tasks with disparate levels of expertise and equipment. There is also variability in the respective abilities of these individuals to report these findings, particularly when interpreting scientific tests. To put it simply, the language of scientific reporting is highly standardised, the language of the art historian is not. There are rarer instances, of art historians, some of whom with varying degrees of scientific training making a concerted effort to present their data in new ways. The greatest advances in this area have made it into certain volumes on controversial attributions, with some of the more notable efforts being by the late Professor James Beck and Professor Martin Kemp. The level of detail provided by such authors are innovative in the field of art history. These are worthy of detailed review, in a manner that goes beyond the type most commonly seen in articles by journalists and art commentators. The following case study will explore this in more detail. La Bella Princepessa was a descriptive moniker ascribed to the drawing of a young woman at the centre of great debate in the art world. Comprising big names, and a potentially large market value, the investigation is at once remarkable and dismaying. With the great sums of money that accompany a potential Leonardo, it can validly be argued that rational analysis is not possible. Immediately the impartiality of the involved parties comes into question. To analysts without the critical tools to pick through evidence, the nature of their reflections on the findings are often largely subjective or presented without a significant level of detail. Other reports invariably took the focus off the evidence being presented, to discuss wider issues pertinent to the art market and attribution process. This type of discussion of is course valid, but incomplete. The investigation into the authenticity of La Bella was conducted by a team of specialists - most notably Professor Martin Kemp of Oxford University, Pascal Cotte of Lumière Technology and Peter Paul Biro, an art restorer with an interest in examining artworks for finger and palm prints. The latter has been in the news recently, having launched a lawsuit against The New Yorker's David Grann. In a fascinating piece of emotive journalism, Grann highlighted some of the concerns with Biro's processes, going as far as to suggest the restorer fabricated fingerprints in other investigations. Biro's work on La Bella will be discussed later, in a manner exploring the validity of such data. Below is a summary of the findings presented for La Bella Principessa, assembled from results reported by external sources and the 2010 publication co-authored by Kemp and Cotte. *Sold on in 2007 as a portrait "based on a number of paintings by Leonardo da Vinci and may have been made by a German artist studying in Italy"
*Summarily contested by Bambach, Fahy, Penny, Marani, Schröder, Kline (and others) - though the degree to which each of these individuals have examined the original and provided a detailed counterpoint analysis is noted to be comparatively minimal against the data supplied by Kemp and Cotte. Examination of this leaf of vellum reveals precise cut marks and indications of stitching suggesting it was cut from a book, the source of which has not yet been identified. Kemp puts forward the argument that it was removed from a volume of poetry produced for the Sforza during Leonardo's first tenure at the Milanese Court. Other examples of Renaissance poetry volumes are cited, although no references to Leonardo illustrating such a volume have yet come to light. 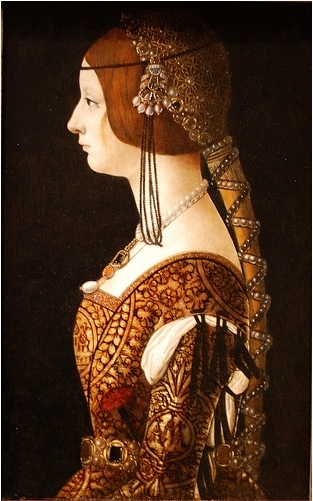 The depiction of the sitter in profile was shown to be in concordance with other depictions of Sforza women from the same period, including the paintings depicting Bianca Maria Sforza and Beatrice d'Este, at Washington and Oxford respectively, attributed to Leonardo follower Ambrogio de Predis (tentatively in the latter instance). It should be noted, Bianca Maria in the de Predis portrait should not be confused with the tentatively identified Bianca in the drawing. Bianca Maria was the eldest legitimate daughter of Galeazzo Maria Sforza, making her Ludovico Sforza's niece. Kemp presents the sitter in the drawing as Bianca Sforza, a legitimised daughter of Ludovico Sforza and his mistress Bernardina de Corradis. After her marriage in 1496, she died a few months later, possibly as a result of an ectopic pregnancy. It has been suggested that the volume of poetry and the drawing were a memorial tribute to the departed Bianca, who would have been 14 years of age at her death. The key evidence to support this is correspondence from Ludovico Sforza's wife, Beatrice d'Este - indicating the family's distress at the death of "Madonna Bianca". In differentiating Leonardo as the author from his Milanese counterparts, Kemp points out subtle factors such as the tension apparent in the chording around the hair, which is not as developed in profile portraits attributed to artists such as de Predis. Kemp's familiarity with the nuances of design seen in Leonardo's notebooks makes such a comparison natural, but it is commonly ignored by critics. Similar are details seen in the knot design on the sleeve, which mirrors designs for the Vincian academy (surviving copies made after Leonardo). That such designs fascinated Leonardo has been passed on to us by Leonardo's notebooks, as well as a famous description by Vasari. A similar consideration of this type of intricate patterning being a Leonardo peculiarity was made more recently in the attribution of Salvator Mundi. An extant Leonardo drawing at Windsor also provides a compelling point of comparison. Although commentators such as Dorment have accused Kemp's selection of drawings as "dealing from a stacked deck" this is a somewhat unfair appraisal. Works of Leonardo's Milanese contemporaries were presented as counterpoints highlighting the nuances of quality of La Bella, in an attempt to differentiate this work from a Leonardo pupil or follower. 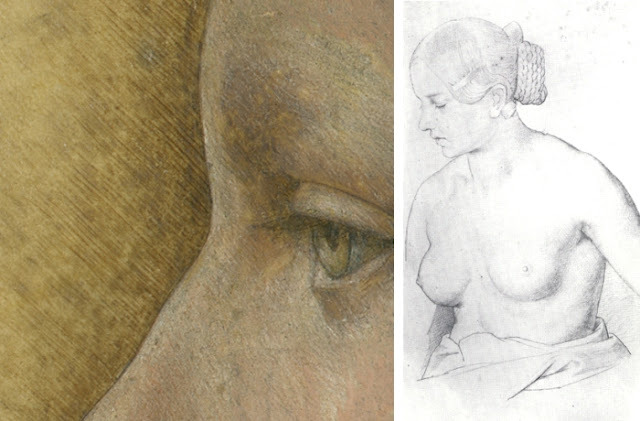 The Windsor drawing is highly relevant, as it establishes a geometric similarity in Leonardo, whose notebooks document a fervent study of the proportions of the human form, including the face. 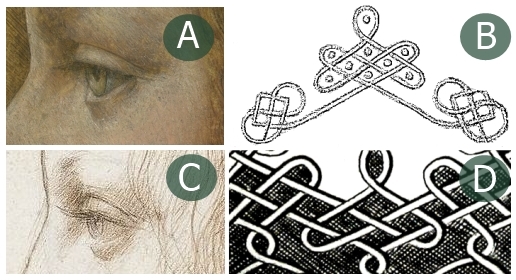 That the two drawings are geometrically congruent can not on its own be conclusive of authorship, but in consideration along with other factors such as the depiction of the eye, cording in hair and knotting design on clothing points towards characteristics that are particular to Leonardo and not seen in his followers. Any critic of this piece must hence be able to produce a work demonstrating these same characteristics by an artist other than Leonardo. The extant depiction of Sforza women from de Predis and others, whilst very fine in their own right do not display these characteristics. If the basic trois crayons technique uses only three colours (black, red and white), how does one explain how the artists rendered the sitter's amber eyes, her green, red and yellow costume, or the brown of her hair? It is a colorimetric fact that green can be obtained by a diffusion of black pigment on a background of yellow. This optical peculiarity was exploited by Leonardo to marvellous effect. He conveyed tones of green by applying progressive strokes of black chalk (no doubt sometimes blended with his finger or the edge of his hand) to the yellowish surface of the black vellum. Unfortunately, the three coloured zones of the costume - green, "yellow"(as it now appears) and red - as well as the brown of the hair no longer represent the original colours of the portrait in a wholly accurate manner. The pigments have also been overlaid by olive green, yellow and brown wash brushstrokes, which are later additions. From an early point in the book, Professor Kemp outlines the rationale for the nature of reporting in the book. Discussion that would typically be left as adjunct text in an appendix has been given its own chapter alongside the usual mode of art historical report. Looking at antecedent works by Leonardo and his pupils, and discussing the historical use of illustrations in volumes of Renaissance poetry is where many other writers would start and end their piece. It was a bold, but important step for an art history publication to make the inclusion of these extra data elements as part of the main body of text. The language of this has been modified to enable comprehension by a wider variety of readers. That being said, those who come to these sections who have little experience with scientific language may need to acclimatise to the language used, rather than dismiss it as "barely intelligible"(Dorment). I don’t doubt that Prof Kemp’s belief in Leonardo’s authorship is sincere. But he is wrong to think he can prove this by steamrolling the public into accepting his attribution. 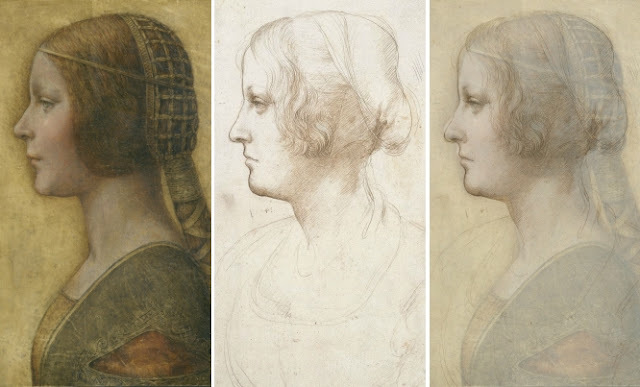 No single piece of evidence proves conclusively that the portrait of the woman in profile in coloured chalks...was executed by Leonardo da Vinci in the mid 1490s or that the sitter is Bianca Sforza. Similarly, no single piece of evidence proves that the Mona Lisa in the Louvre is a portrait of Lisa Gheradini...commenced in 1503 and finished a good deal later.... The now secure position of the portrait of Mona Lisa del Giocondo in Leonardo's body of autograph paintings depends on an accumulation of interlocking reasons, and, not least, on the way that the painting participates in how we actively see Leonardo as a whole. Kemp's ability to shift gears between the disciplines of art history and science have as much to do with his own past training, than his omnipresent role as an established authority on Leonardo attributions. Many of his previous publications discuss Renaissance painting as an occupation akin to a scientific pursuit by artisans adopting a research based approach, accounting for the astounding advances made in optical realism in the 15th and 16th centuries. Negotiating modes of reporting inherent to the arts and sciences is a challenge not faced by many art historians outside of those working on attributions and in conservation departments. A scientific document will focus strongly on the evidence presented and its ability to clarify the issue being investigated. If Kemp were to have adhered to a more rigid technical mode of reporting, many of the critics of La Bella Principessa would have had much less to lament. Had the book expressed the realities of the process outlined in the epilogue at the start, and relied less on individual pronouncements of opinion, its strength as a scientific document would invariably have been strengthened. In an art historical sense however, the presentation of these findings without the final verdict of such a renowned expert would ultimately have been unsatisfying to many readers. A more lucid presentation of the facts and the process of analysis was written by Jo Ann Caplin, an art historian with a background in Chemistry. This rational and detailed piece was written for the Spring 2011 edition of the magazine of the Chemical Heritage Foundation link It provides the fullest account of the details and rationale employed by Kemp and his associates, and highlights that a search for further supportive evidence is continuing. Among the wealth of data presented in the 2010 publication, there is some small consideration given to clarifying why the piece is not a 19th century or later copy, and some comment on the efficacy of the scanning technology used by the Lumière system and the analysis performed by Biro. In statistical terms, this is called validity. The Cambridge dictionary of statistics succinctly defines this as "the extent to which a measuring instrument is measuring what was intended". This type of discussion is vital when presenting information of a technical nature. In the analysis presented by Kemp and Cotte, there is some reporting of this nature, primarily around the Carbon-14 testing results, and elements of the multispectral scanning system. Carbon-14 testing performed by the Institute of Particle Physics in Zurich dated the vellum between a date range 1440-1650, establishing it as contiguous to Leonardo's era. It should be noted here that the stated probability of this date range is 95.4%, whereas the the interval between 1470-1530 is 27.2%. These probabilities are related to the properties of substances subjected to the radiocarbon testing method, compared against estimates of atmospheric carbon levels during the periods in questions. Without delving too deep into the nuances of carbon dating, this finding is presented as statistically significant to allow a confident statement that the piece of vellum was in existence in the c.1495-6 date proposed by Kemp. There are no other known works by Leonardo on vellum, but there is previously neglected evidence of his interest in making coloured images on prepared animal skin...the most intriguing passage occurs in Leonardo's so called "Ligny Memorandum" in the Codice atlantico...Later in the note he writes: "Get from Jean de Paris the method of dry colouring and the method of white salt, and how to make coated sheets; single and many doubles; and his box of colours; learn the tempera of flesh tones, learn to dissolve gum lake..."
This is believed to be a reference to Jean Perréal, a French artist travelling through Italy after the invading French emperors. He is cited as being in Milan with Charles VIII in 1494 and with Louis XII in 1499. The references to "dry colouring" and "box of colours" is interpreted as using a non-paint medium to apply colour, such as with chalks. The reference to "coated sheets" and "single and many doubles" is interpreted as a query on how to maximise as many single and double rectangular pages from an irregularly shaped stretched animal skin. The "gum lake" and "coated sheets" is also a reference to a substance commonly used by artists known as gum arabic. Extracted from acacia, it was often used as a binder for pigments, and a fixative for sheets of vellum. 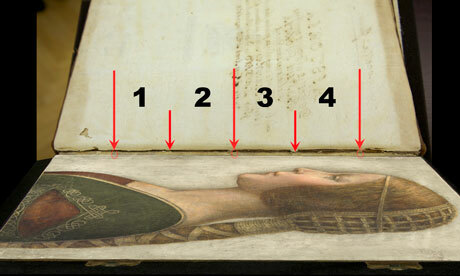 Technical examination of La Bella verified the presence of gum fixative over the original layer, as well as a subsequently applied sealant, believed to be the work of a restorer. Although the use of coloured chalks as a medium is traditionally ascribed to French artists, it is clarified that there are no extant examples of Jean Perréal's work in this medium. 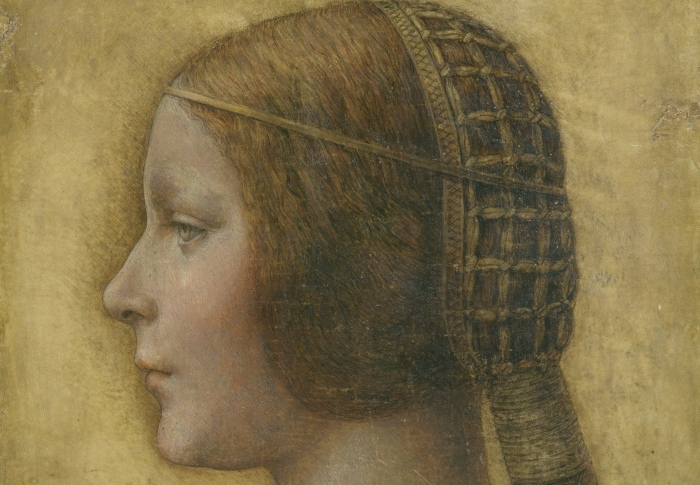 Kemp also provides examples of work in coloured chalks by his Milanese counterparts, attempting to demonstrate in each instance they lack the combination of Leonardo peculiarities seen in La Bella. That this comparative evidence is more thoroughly explored has hardly rated a mention by any of the critics of Kemp's presentation, making the "stacked deck" allegation by Dorment seem somewhat unwarranted in particular. Kemp and Cotte also provide a detailed account of the layered presentation of the original drawing and subsequent restorations and application of pigment. Some comment on the ability of this to be mimicked may have been useful. 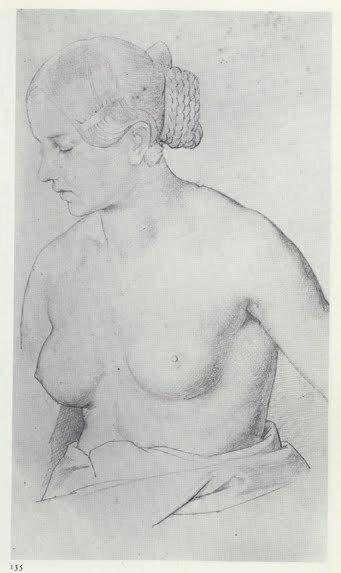 Subsequent critics(such as Kline) who attribute the work to German artists working in the 19th century would better serve their case by submitting evidence of these artists using 15-16th century vellum and a detailed analysis showing earlier or later marks on the surface being indistinguishable. At present, the extent of Kline's evidence seems to be a "identical young woman", also drawn on vellum. An account of the age of vellum sheets used by artists such as Julius Schnorr von Carolsfeld and a presentation of detailed analysis of La Bella that betray a 19th century author would be welcome, but presently has not been made. Another significant point is that the drawing presented by Kline shows a type of hatching that is quite different from the type seen in many Leonardo drawings, a downward diagonal suggesting a left hand. This is seen in many examples beyond La Bella, and allows even the most casual observer to look at Kline's submission with a healthy dose of scepticism. Another critic affirmed that left handed shading has been faked by other Leonardo followers, such as Francesco Melzi, but a detailed assay of this has not been presented. A thorough comparison of the mode of sketching in a faked left hatch and authentic Leonardo drawing would be a better way to refute this. Indeed, in the course of the analysis Kemp and Cotte also demonstrate that restorers aiming to recreate faded sections of this hatching had their work betrayed when examined under the high fidelity of the Lumière scans. The multispectral imaging system provided by Lumière Technology provides a level of detail unprecedented in art analysis. It produces images of a very high fidelity, revealing elements of the piece being examined via filters that have a varying ability to penetrate certain materials. The most well known example of this principle is of course X-Ray analysis, where X-Rays have an ability to penetrate soft tissue, but not bone, allowing visualisation of the skeletal system. A multispectral scanner works in a comparable manner, but rather than the subject being tissue, it is an artwork with different pigment substances arranged in layers. It should also be clarified that multispectral scanning is not peculiar to art analysis, but commonly used in a variety of disciplines, from engineering to geology, to provide fullest possible set of data on the properties of substances or objects being examined. That this technology has been applied to art analysis was a scientific inevitability as it is a non-destructive means of providing detailed readings and images that also have the advantage of being shared as digital files. Museum and conservation organisations would readily welcome access to the quality of images produced by such a system were it presently not as cost prohibitive. Below is an excerpt from BBC's Fake or Fortune, where Philip Mould, leading the investigation to gather more information on the alleged Monet owned by David Joel discusses the multispectral scanning system with Pascal Cotte. It is a succinct summary of the technology, and includes a demonstration of how it was applied to a more famous Leonardo piece. More info on Lumière's work, including the scanning of La Bella Principessa can be viewed at their site. Fingerprint examination: data, media focus and the CSI effect? Much has been murmured about the inclusion of finger print discussion by Biro. Particularly in light of recent allegations of fraud made by The New Yorker columnist David Grann, and the subsequent lawsuit against him. In the emotive art world, there seems to be prevailing guilt by association that weaknesses in this method in some way detract from Kemp and Cotte's results. This is an incorrect assumption. What may be more useful is looking at the actual data supplied by Cotte and Biro, and examining it on its merits. That artists, including Leonardo used elements of their hands and fingers in remodelling applied media is obvious. Whether a discernible methodology can be applied to examine these marks is the focus of the work of people like Biro, who in his work as an art restorer would have often noted such marks in pigments under a magnification source. The key impediment to this analysis is that we do not have an extant set of prints from Leonardo to make the comparisons a less equivocal process. What is more valuable is the attempt to gather a larger pool of data to describe technique, including use of hands and fingers by artists working in a given era. Biro's work to establish a database of marks on artworks is a useful idea with broad practical scope. That it has been linked more prominently to attributions specifically is unfortunate, an element promoted more by journalists than by professionals dealing with attributions. Outside of a 'forensic' context, such observations are commonly stated in technical reports issued by museums and conservation organisations. As far as the key print mark on La Bella Principessa, scanning reveals the ink to be contiguous to that used in the rest of the drawing, which can be readily distinguished from the restorations. Whether markers are consistent with 'prints' on other Leonardo works was never a consideration on which the attribution rested in this instance. Hence, although the 'fingerprint evidence' has been heavily promoted by journalists, it was never a conclusive factor of the investigation. For the sake of completeness, the following is Kemp's summation of this evidence as stated in the book. I have bolded elements of the report's language to highlight the caution with which this is presented. At a historical distance of more than 500 years, no forensic evidence is likely to be wholly conclusive. We cannot, after all, take prints from Leonardo's own hands. However, the likely correspondence of the fingerprint found on La Bella with prints on Leonardo's unfinished St. Jerome is an important piece in the jigsaw of technical and stylistic evidence. 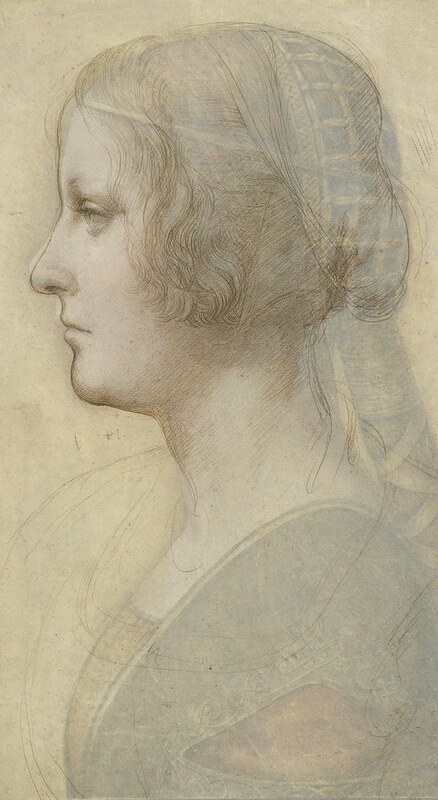 Once thought to be the work of a 19th century German school, the drawing of the young woman in profile now has a tentative attribution to Leonardo. Its critics are numerous, yet in each instance a detailed account of confounding factors has not been provided. Evidence of later artists using 15th/16th century vellum needs to be produced, as well as analysis confirming that later marking of these sheets can be differentiated from those of earlier periods. From reports made in various media, many of the objecting commentators have not seen the work in person. One of the scholars who did, Pietro C. Marani, an Italian Leonardo scholar was worried by the nature of pigments, the "firmness of stroke and the absence of craquelure." It was not clarified whether we should be expecting to see craquelure on a leaf of vellum which has been dated to the 15th-16th century, one which has had hatching elements touched up by restorers and pigments added at a later date - all mentioned in Kemp and Cotte's analysis as discernible from a lower and faded layer of original work. Connoisseurs that target the mode of drawing, the nature of the detail and media will need to account for a unified presentation of facts, as summarised by Kemp and Cotte. For example, putting forward that other artists faked left handed hatching to simulate Leonardo drawings on its own is not enough to account for the many elements to this piece. That there is a fingerprint on the work potentially corresponding to another Leonardo work is a data point given only a diminished weight in the original analysis. Anyone seeking to undermine the nature of the findings presented by Kemp and Cotte would better spend their time finding a piece of similar quality, media and age characteristics from a 19th century or later artist. The examples offered thus far have been poor at best, with no comparable level of analysis. Klaus Schröder of the Albertina Museum in Vienna is also a reported critic. Of particular interest would be the findings of the Vienna Academy of Fine Arts, who examined the piece. The results of these findings have been difficult to discern, and the reasons for Schröder's rejection of the piece not entirely clear. Why do many scholars decline to be identified in attribution disputes? "Scholars usually don't talk about other scholars," said William E. Wallace, Barbara Bryant Murphy Distinguished Professor of Art History at Washington University in St. Louis and an authority on Michelangelo. "It's a small world. I'm being approached all the time. I just don't want to get into the fray. Maybe we have fragile egos and we want people to be our friends. It's not fun to gather enemies." In presenting these findings as a book review, I would like to categorically state I have no opinion on the author of the picture. What is more intriguing to me is the process of attribution. Kemp and Cotte have presented a sizeable amount of data as to why they believe it is a Leonardo. It is frustrating to see critics and reviewers dismiss the work without a detailed account as to why. Anyone interested in the pursuit of knowledge welcomes more data, and its application in a critical manner. The overall counter of the critics has furnished little actual detail beyond subjective opinions, often ignoring key points of the results presented. It is in cases like this we lament the passing of Professor James Beck. His objections to an attribution came with a detailed rationale, extra documentary evidence and comparison pieces, not just a conclusion based on intuition. What may ultimately prove most useful is the fleshing out of La Bella's provenance, including identification of the source volume it was cut from. If this could be produced, and dated to the period in question, it would provide a facet of evidence that speculative critics would have their work cut out to refute. What is sometimes missed when there is such conflagration over authenticity is the undeniable beauty of the drawing, regardless of its author or period. It is quite charming, and we should be glad it has resurfaced, despite the scholarly jousting and vast sums entangled in it. On Tuesday 27th September 2011 The Guardian announced Kemp's discovery of the source volume - a 15th century book created for the House of Sforza, known as the Sforziad, located at the national library in Warsaw, Poland. Technical evidence is only briefly mentioned, particularly in regards to the vellum in the book - which "closely matches" the vellum of the La Bella drawing. In addition, we are told that stitch holes and incision marks correspond precisely from the cut page to the source volume. Critics of the piece must now re-orient their approach - an argument that it is by a Leonardo contemporary may still arise from some. Although any allegation that it is a later piece is less likely to stand up against the body of evidence amassing for this work. As Kemp states, "Assertions that it is a forgery, a pastiche, or a copy of a lost Leonardo are all effectively eliminated." The case of the missing frame? Perhaps the greater mystery that has arisen from this discovery is the fate of the frame the excised drawing was originally placed in. If placed in an Italian frame, how did it end up in a German frame in time for its sale by Christies as a 19th century piece? What also remains to be seen is how this new information will affect the lawsuit against Christies. On January 25th 2012, Mystery of a Masterpiece was aired on the NOVA program on PBS in the US. It provided a wonderful overview of much of the evidence presented above, though its true highlight was the section on the identification of the Sforziad source volume in Poland, a short clip of which is excerpted below courtesy of PBS. If you would like to see the full program, it is now available on DVD or from the NOVA site (US users only). It includes a detailed, new analysis of the fingerprint evidence, categorically dismissing it as relevant to the case. Special mention must also be made of Professor D.R. Edward Wright - an art historian from the University of South Florida - credited with suggesting the Sforziad as a possible source to Professor Kemp. Da Vinci, L., Richter, J.P.(Trans. ), Richter, I(ed.) Leonardo da Vinci: Notebooks. Oxford University Press. 2008. Everitt, B.S., Skrondal, A. Cambridge Dictionary of Statistics (4th Edition). Cambridge University Press. New York. 2010. Fake or Fortune. Episode 1. (documentary). BBC. 2011. Great post! I was only familiar with the fingerprint examination in regards to the "Bella Principessa" attribution. Learning more about the other attribution methods taken for this specific attribution have made me become less critical. I applaud Kemp and Cotte for the considerable amount of data that they have presented. Of course, if I was going to claim that something was created by one of the great Renaissance masters, I would want a lot of data to support my statement! Hi M - cheers for the comments! It is somewhat unfortunate that much of the journalistic coverage of this attribution focused on the fingerprint examination. There is a legal industry term for this which is somewhat apt - "CSI Syndrome" where the role of forensic evidence is given a greater weight. Scientific evidence can provide important details, but forms only part of the picture. It also has an inbuilt capacity for error (expressed as probabilities in the C-14 tests for example). It basically comes down to taking the time and looking at *all* the evidence in as thorough manner as possible. Until Jo Ann Caplin's piece (and hopefully this one) it seems few commentators had bothered to take the time and look at the evidence beyond the "fingerprint"
I do fear, though, that the fingerprint evidence has set back the cause of the Bella Principessa, at least temporarily. 1 - the actual surviving portion of the fingerprint illustrated is so weak, and its apparent comparison to a 'real' Leonardo print is so tentative, that even an amateur sleuth can see that the evidence borders on the fantastical. 2 - Thus the guilt-by-association tag is valid, for it makes one doubt the ability of the drawing's advocates to properly evaluate the rest of their evidence. 3 - It should have been obvious to the drawing's backers from the outset that even a cautious 'fingerprint' claim would be seized on as the most eye-catching evidence. And, by extension, any weakness in that evidence would reflect badly on the whole case. It seems that there is a flaw in the model of 'launching' a lost picture with a book. Forcellini's 'Pieta Perduta' is another recent example. You might sell a few copies, but it doesn't seem to do the picture any favours. One cannot help but draw a contrast with the way the Salvator Mundi has been handled by its owners, which was the very model of discretion, caution, and tact. Cheers for the comments Bendor. Welcome to 3PP. It is interesting to note how much the owners have a part to play in the information that is distributed. I am told the owner was given forewarning that the fingerprint evidence would be given a heavier weighting by commentators, despite it being a minor factor of the expert analysis. This is quite simply as it is easier to report on, and more familiar to the public than talking about multispectral scans, colorimetry and hatching. Nevertheless, it seems a decision was made at some point to press ahead with it. I would venture to say the owners of Salvator Mundi learned from the lessons of the La Bella case, hence no book is out (yet) and no whiff of fingerprint information is mentioned regarding their ghostly Christ! I'm still wondering where the lovely full beard has gone from Hollar's engraving to what we see now - has it really been all cleared away by restorers?! My aim in writing this summary was to focus on the range of evidence presented by Kemp and Cotte, which must be treated on its own merits. To take a lesser factor like the fingerprint mark and use it to judge the rest of the evidence as invalid is not a type of analysis worth promoting, in any discipline. It may have had more weight in the other instances (such as the Turner case), but it simply was not weighted as heavily in this analysis (despite its heavy journalistic coverage). I eagerly await any news on further evidence, presented from either side. Through I doubt we will see anything from the critics of the piece, who have presented very little as far as detailed countering evidence is concerned. As for Forcellino, I look forward to presenting a similar summary of the processes outlined in his new book. As someone used to reading about new research in my own field in science and medical journals, I am very unaccustomed to the 'straight to book' method before peer review has occurred. Edit note: Following reader request, I have included Kemp's words on fingerprint examination from the text, as well as some third party journal article links exploring 'CSI effect'. Discussion/quotes pertinent to Leonardo sources indicating a possible interest in vellum and coloured chalks has also been added in its relevant section. Brilliant post as always. I'm afraid I got blinded by the science a bit, much like Kemp's BP book. Cheers for the comments David. The straight to book question is a difficult one here. There generally doesnt seem to be a peer review process in art history unless an auspicing organisation (or owner) pays a bunch of folks to get together and form a consensus, which is just not how it should be done. I think it was all a matter of timing, and some PR faux-pas on the part of the owners/their representatives. This is why you have a much more measured approach with the Salvator Mundi crowd, who must have payed very close attention to what happenned with La Bella. It speaks volumes that the voice of owners/scholars is superceded, and all info released from a PR reps site. I may have had an easier time with the science than some, but even Cotte provides a summary of results on pp.184-186 which is easy to follow. I would direct people towards that, anything is better than dismissing it offhand and then focussing on the fingerprint evidence, as so many other reviewers and commentators have done. I wonder how long it will be before we hear of any new developments on this case? With the PR issues and fingerprint stuff aside, I think it was a bold and important move for Kemp and Cotte to present this book the way they did, knowing that many people would dismiss the science and focus on the fingerprint. Reporting scientific findings related to art history is in its relative infancy. There is no standardised way to do it, as in the sciences, and you are dealing with an audience with a disparate level of familiarity with that type of reporting and its language. The way forward is to help bring everyone up to speed. There is nothing to be gained by keeping people in the dark. Just as your supervisor said "prove to me its by him" one could respond "prove to me its NOT by him" this is the essence of the null hypothesis and understanding the validity of evidence presented. Thanks, Hasan, for laying out the arguments (and non-arguments)so cogently! This sounds like a FOUR Pipe Problem to me! Many years ago, an Italian friend (who had seen it all) observed, "Attribution is more art than science, but science is not necessarily a bad thing, when all else fails. But when you are faced with a controversy, you must remember that the actual identity of the person who created the object is a marginal consideration at best." "...before you advance any argument about this Poussin drawing, prove to me it's by him." If only more supervisors took this view! "...you must remember that the actual identity of the person who created the object is a marginal consideration at best." To those who say authorship is not relevant, take what I call the self-portrait test. Look at a self-portrait by, say, Rembrandt, and ask two questions. Is the fact that it is by Rembrandt only a 'marginal consideration' to our understand of the picture? Or is the identity of the author central to our understanding of it? I'm sure Edward can clarify that comment himself, though I can understand such a sentiment from the perspective of trying to maintain a degree of rationality when wading through evidence. As I argued in the piece on David Joel's (alleged) Monet - were there not such a potentially high market value for a piece by that artist, the pursuit of the facts behind the piece becomes an academic exercise, and would not as readily capture the public interest. Those of us interested in amassing greater volume of data on artistic technique across eras will find more data on more famous artists because their works are worth more. However, when looking at less prominent artists, such data is more scarce. That popularity and market forces guide research is lamentable. As seen with La Bella Principessa, it leads to poor decisions made under pressure, media distortion of factual reporting and results in PR people being appointed to be the purveyors of technical and stylistic information - as seen in the Salvator Mundi - something which we should never applaud! Perception doesn't lie; it's a Leonardo. Look at the drawings, look at the way he draws the eyes and the bust (compare the bust on this with the Mona Lisa), and also the way he draws a lot of portraits in profile - the entire composition of this contains all of his signature marks. The date is accurate enough for it to rule out any chance of it being such a masterful copy. It's on that material because it was a royal gift - that explains that anomaly. It is 100% a Leonardo, no doubt in my mind. My only concern is as to why Christie's took off it's Italian frame and replaced it with a German one so they could market it themselves - who do they think they are? It should be illegal to do so, I hope they get humiliated over this. They have too much power. cheers for the comment anon. I dont have an opinion on whether it is a Leonardo or not but I do share your concerns over Christies accountability for changing the frame - if that is indeed what they did. Also, thinking of Ms. Marchig (previous ownner) and her lawyers - I wonder what turn her case against Christie's will take now? It could prove very damaging to Christies, not to mention the reputations of the NY experts who were so sure of their 19th century verdict. Thanks to H Niyazi for a wonderful commentary on this fascinating debate. I emerge from it with a much greater insight into the melding of science and art and will use its construction to inform my academic teaching - correctly attributed, of course! Thank you again! Many thanks for the positive feedback Stephen! Welcome to 3PP! The presentation of the evidence that LBP was taken from the book is not conclusive as it appears. The book was rebounded in the 16th century, but no evidence was presented to demonstrate that two additional stitch holes were added at the time. The other two copies of Sforziad in velum also have more than three stitch holes, LBP might fit well with them as well. The Warsaw copy was gilded all three sides after rebound, perhaps at least 5 mm or more would be trimmed on all three sides, then the dimensions of LBP would not fit so well with the volume before the rebound. Dear Anonymous, thank you for the contribution. While neutral observers such as myself welcome extra data, such cryptic and anonymous comments add little substance to the discussion. Can anyone say for certain when the sheet was actually sliced from the book - before or after it was rebound? Msr Cotte and Prof. Kemp seemed to make no speculation in this direction. All we do know is that it was excised at some stage, laid on an oak panel and ended up in what is described as a type of frame which led to its description as a work by the 19C German (Nazarene) artists. This side of the story is admittedly murky, but does not detract from the original analysis of the work itself for its Leonardesque characteristics. Contesting authors are encouraged to share *detailed* findings in their own publications, on the web or otherwise. As yet no such detailed counter analysis has been forwarded, nor a work on 15C vellum of comparable quality clearly linked to the Nazarenes produced. Purely for the sake of testing the evidence - I'd like to see one, but it seems a tall order. Great post. I really the way you present the "principessa" alongside other paintings for comparison. Still, I felt like your post further added to my understanding of the controversy-- especially with regards to evaluating Kline's attribution to Schnorr von Carolsfeld. Hello Meeg. Great work on the summary. It's nice to know others can write about this contentious topic and remain neutral - no mean feat in commenting on Leonardo!